Inspired by a name from an 1879 model Lamborghini introduced its all new Lamborghini Huracan LP610-4 2015. It is well known that company is packing bags for Gallardo soon to get replaced with a new model; simultaneously same news came for the Huracan. In the mean while at the 2014 Geneva Motor Show came the unveil ceremony of the all new Lamborghini Huracan LP610-4 2015. 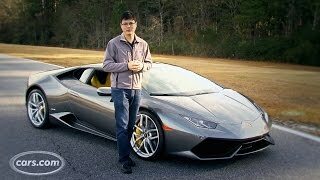 Let us have a go through at the review of Lamborghini Huracan LP610-4 2015 to know what Lamborghini has to offer at such a turning point. Interior of Lamborghini Huracan LP610-4 2015 brings some surprises for you in form of redesign and upgrades. The queue begins with newly designed dashboard featuring stuck A/C vents. While the center console is mounted with all required control beneath huge 12.3 inch TFT display providing you all the vital information you might need. Talking about the material used in making interior of Lamborghini Huracan LP610-4 2015, you have this entire luxuriously sporty arena dipped in Alcantara and carbon-fiber. Serving not only the purpose of making this model lightweight but also add to the luxurious feel you expect while looking inside a Lamborghini. Exterior of Lamborghini Huracan LP610-4 2015 in simple words is unique creation through its engineering and designing. Starting with the front fascia you have larger air intakes heading closer to the middle part while LED headlamps carries the technological glory from Aventador and takes it a step ahead by inculcating pair of Y-shaped headlight unlike that in Aventador which only had one. With its length shorten than Aventador you can easily notice the difference and thus the air intakes are smaller with sweeping strokes covering the sides. Moving towards the rear fascia of Lamborghini Huracan LP610-4 2015 you have sharp edges across with lower sitting diffuser and slim elongated taillights. 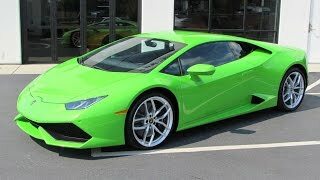 Lamborghini Huracan LP610-4 2015 is powered by the same 5.2 Liter V10 engine but this time it delivers more power in compared to its history chart. With total output of 610 hp and peak torque of 560 nm mated to seven-speed dual clutch transmission the Lamborghini Huracan LP610-4 2015 is capable of reaching a top speed of 202 mph keeping the fuel consumption to 12.5 Liters per 100km. With this power and figures the additional badge joins with Lamborghini Huracan LP610-4 knocking the 0-62 mph sprint in just 3.2 seconds.